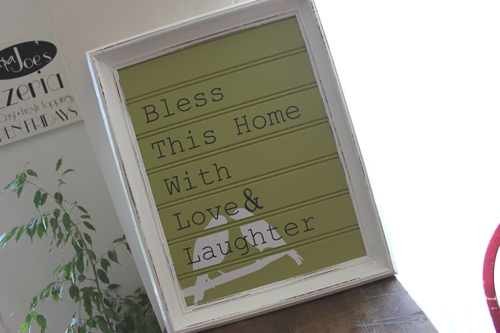 Did you guys see this cute DIY wall art from Poppies at Play? I love the idea of putting bead board in a frame. And of course I'm loving the birds! And the second thing is I'm loving these "home" blocks with seasonal "o's" from Stick with me Vinyl Isn't that fun?! I think they would be a blast to make and would be such a fun gift! Thanks for the inspiration! Feel free to grab a featured button in you want one! I have been hinting about my kids bathroom re-do but it has taken forever to complete. Not that anything has been particularly difficult, it just has been a project that was too easy to put off. (You know how that goes right?!) Sorry about that. I am super close to being done though. Before the full reveal, I wanted to give you a sneak peak and show you my newly painted cabinet. My whole house is full of golden oak. I hate it. I have been planning on getting rid of it since I moved in but have been to scared to take the plunge. This bathroom was the guinea pig and I LOVE how it turned out! Isn't it lovely?! I am so happy and excited about how it turn out. The finish really is great. Even my very skeptical, "I like wood," husband thinks it turned out amazing. I know there are many tutorial on painting cabinetry but here is my method. Step 1. Take everything apart. Remove all the doors, drawer fronts, knobs, and hardware. Step 2. Sand. I used a palm sander to sand everything. You don't need to get to bare wood here, just rough it all up so the paint has something to grab on to. Step 3. Clean. Wipe everything down to remove any dust from sanding. Step 4. Prime. Since this particular cabinet was going a color, I had my primer tinted. You want to tint your primer if you plan on distressing. My primer coat was pretty thin, so don't worry if its not covering great. Just be sure to put on an even coat. Step 5. Paint. I did two coats of latex paint. I actually used the exact same color that I used on the walls. You can use a roller if you want, but I just used a brush. I did both the front and back of the doors, letting the paint dry completely before turning it over. Step 6. Sand again. If you want a distressed look, sand the edges and any other place you want a worn look. Step 7. Stain. Put a coat of wood stain over everything, wiping off any excess. Let that dry. It may take awhile. Step 8. Polyurethane. I love the ease of wipe on poly. I did two coats of poly, doing a light sand between coats. A lot of people don't do poly, but it really gives it a nice finish and is a little extra insurance that it will hold up. Step 9. Once the poly is dry, reassemble the cabinet. A long process, mostly because of drying time, but nothing really difficult. And the results are wonderful! I can't wait to show you the rest of the bathroom. It's coming soon, promise! So, the other day my Mom asked me to help her decorate above her fireplace. It was a challenging spot because of the scale. It is high, has a huge blank area, and is visible from the balcony upstairs. Whatever we put there had to look good from multiple angles. Here is what we came up with. My Mom has such a pretty house. Here is another shot so you can get a perspective of the scale. A lot of blank wall space! I made the display mimic the shape of that. The molding seems to make more sense now. So the tallest item, the two trunks went in the center and we build from there. The left side has some lanterns, a basket of greenery, and a bird cage. And the right side has an outdoor statue, copper platter, faux books, and a model airplane... with some more greenery. I like having greenery throughout my displays. I feel it helps tie everything together. It was a fun spot to decorate, (but scary, you should have seen me on top of that ladder!) and I am happy with how it turned out! But the best part is that my Mom is happy with it too. So hopefully if you have a tricky spot that needs some "stuff" you will feel inspired to tackle it. I was SO excited to see that Blogger added a new favicon feature! 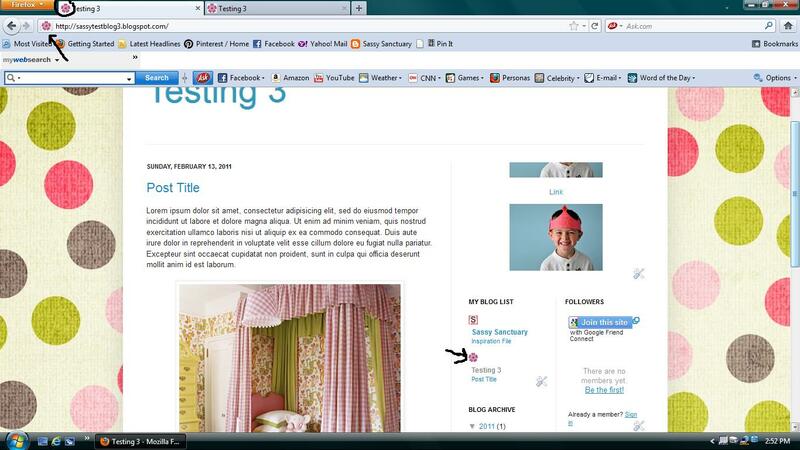 (If you don't know, a favicon is the little image that is next to your web address.) 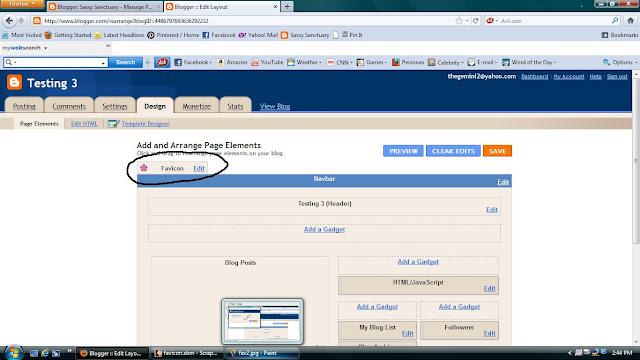 Favicon are fun to have because they help your blog stand out from others when in a list of bookmarks or on a blogroll. I have done favicons in the past using html hacks and haven't been very happy with the results. But Blogger has made it SO easy to add now, and the best part, it works! So, first you need to create an image. This can even be done in paint. I created mine at 160 x 160. The size really doesn't matter because blogger will shrink it. Just keep it small so that its easy to load. I recommend a simple image. Because a favicon is so small you can't really see a lot of detail anyway. 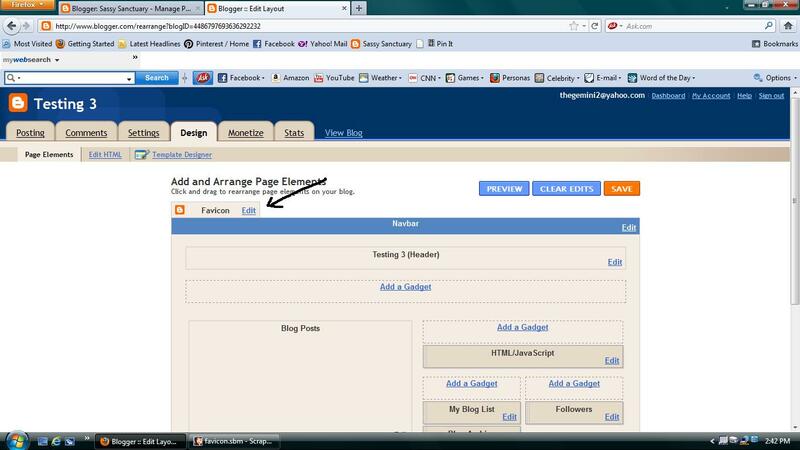 Sign into Blogger and go to your elements page. See the new little gadget. Ahhhh... love you blogger! Browse for the image that you have saved. (Yes, a jpeg image will work) Hit save. Blogger will resize it to fit. You now see your little favicon image on the gadget. 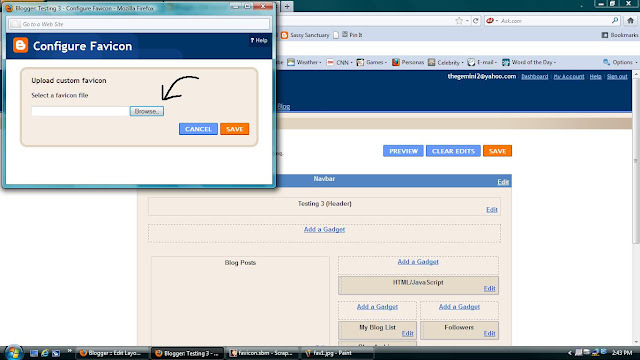 Hit save and view your blog and you'll see that it didn't work. What?!?! Calm down. It did work but your computer saves information so it doesn't have to reload everything every time. Go HERE and download CCleaner. It will clean your computer of all that crap. Then go back to your blog. Your favicon will now show up on your blog and also in blogrolls on other peoples blog. So that's it! Super easy and tons of fun! Good luck! Hey, in case you missed it, here is my WYLTC post from last week. Melinda hosted and made the cutest birdhouse! I am loving the variations all the ladies came up with! If you missed it, be sure to check them out! Also, the link party is going on now HERE so link up! 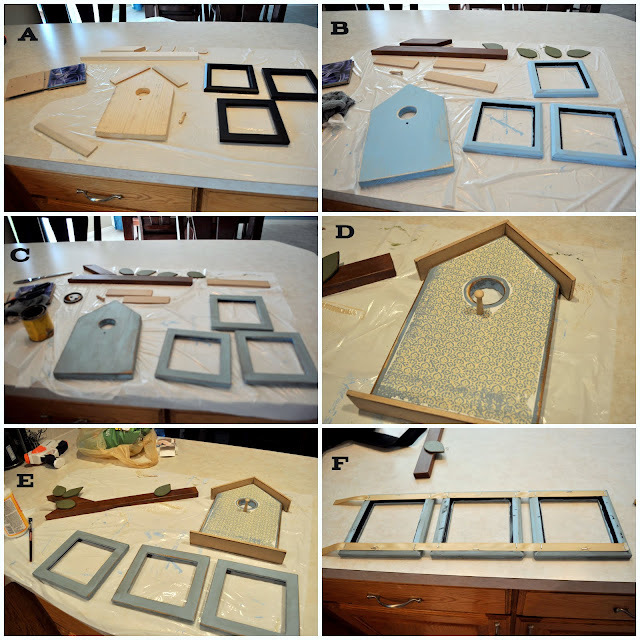 You can link any project that is inspired by birds or bird houses. There will be a prize! Hello! It's Krystal from Sassy Sanctuary here. I'm so exciting to be visiting Melinda today! I have so much fun with WYLTC each month and these ladies always inspire! I totally love Melinda's cute bird house and think its a perfect shelf or table top accessory. I'm currently in the process of re-doing my kids bathroom, so my brain is there. I was in need of some wall art, so I wanted to see if I could take Melinda's cute idea and make something that could be hung on the wall. This is what I came up with. Fun right?! I'm super excited about it because it was the perfect solution for an awkward space. Plus, the bath had yet to develop a theme but this is the perfect jumping off point. The wheels are turning now! Anyway, as you can see I took the basic birdhouse design and made it flat so it could be hung on the wall. The branch was created so that the piece would hang correctly against my new board and batten walls. And the hanging the pictures from it adds that fun personal touch. So, here is how I did it. A. Gather your supplies. Everything here was made from scraps except the picture frames and peg. The frames were on clearance at Micheal's and were the kind that are two frames hinged together. They ended up only costing $2.50 each. My frames are 5x5. Anyway, you want 3 frames, a board cut into the share of a house, some slats to cut the roof and base from, and some ribbon. I cut the roof the easy way making one side 1/4" larger then the other one so I didn't have to cut any angles. Drill the hole for the bird door and the peg. If you want to make a branch too, that was cut from leftover 2x1 trim boards and the leaves from 1/4" plywood. B & C. After you cut all your pieces then paint, sand, and stain. D. I also decided to modge podge some scrapbook paper to the front to add some pattern. I originally planned on putting a quote on the bottom of the house, but in the end I didn't like the way the text looked with the paper. But if you want to use a simpler pattern or skip the paper, a vinyl quote would be perfect there. E. Then I took the easy road and just hot glued all the pieces together. F. Hang the picture frames to the birdhouse by stapling them to ribbon along the back of the frames. I hung it to the wall by screwing the branch into a stud and then hanging the birdhouse to the branch with a picture hanger. That's it. It was really a fun project and all the cuts were super simple. Love those kind of projects! I think it's such a fun way to display some photos and I'm super excited with how the bathroom is coming along! Thanks so much for the inspiration Melinda and for hosting! I can't wait to see all the bird/ birdhouse decor everyone else comes up with!. It is WAY past time I do an inspiration file don't ya think?! Sorry if you have missed them because I have been a total slacker! First up, I have loved my fabric flip-flops and plan on making another pair. So I was super excited when Ashley from Make it and Love it made some too! Hers are so cute! My next pair will look very similar. Next, I'm totally loving this paper wreath! Laura from Corner House has a fabulous tutorial if you want to make your own. I particularly love the pops of color from the scrapbook paper. I'm going to have to put it on my to-do list because it is just too pretty! 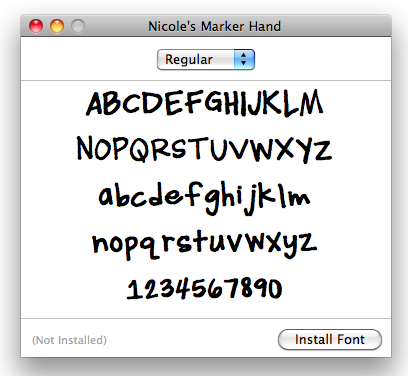 And last, I am so excited about the tutorial from Wonderful Joy Ahead on how to create your own font. I'm a font junkie so the thought of having a font made by me is a dream. Doing this asap! Well, that's it. Thanks for the inspiration! Grab a button from the sidebar if you were featured and want one. P.S. We had a great WYLTC week! I love all the birdhouse inspiration and can't wait to see what you all come up with! The link party is on now, so link away! Jessica from My World Made by Hand is hosting a great "red, white, and blue" round up for the month of July. Today it's my turn and I'm sharing my Uncle Sam tutorial, so come on over and say "Hi"! Be sure to check out all the other fun red, white, and blue ideas while your over there. You won't be disappointed! Just a heads up, Wood you like to craft? has begun! Melinda is hosting this month so head over and check it out! I'm super excited to see what everyone has done and for you guys to see my project, so be sure to check back all week! The link party will begin on Friday and we invite you to link all things birds or birdhouses. Can't wait to see what you do! So, I'm totally having bloggers guilt. As I mentioned earlier, I have a bunch of stuff in the works, but nothing I can share. So my blog has sat this week without any new content. (wah wah) This morning it was really starting to get to me so I decide I could at least do an inspiration file. Unfortunately, all that is in my file is 4th of July stuff and I'm kinda over it... as I'm sure you are too. So I decide to tackle a quick little project that was on my to-do list. My inspiration came from THIS tutorial from The Mother Huddle. I originally was going to make mine exactly like hers, but the knot hurt my feet. I'm totally a shoe wuss so its really not that surprising. Then I came across a link to these, so I made mine like that instead. Cute and so comfy! Just my style! All you do is find a cheap pair of plastic flip-flops (mine were $1 at Micheal's) and remove the plastic straps. Then take some scrap fabric (I actually bought a fat quarter at Walmart, also $1) and cut it into strips. My strips were about 4" wide and about 24" long. I ironed them in half lenghtwise so you wouldn't see the wrong side. Use one strip to make a loop through the toe, knotting at the back, and then thread the second strip through the loop and knot in the back of the other two holes. Seriously, $2 and about 15 minutes is all it takes. Oh, and guess what?!?! All of these pictures were taken in manual mode on my camera without any editing. Aren't you proud of me?! I'm super excited about it! Also, if you are wondering what happened to Wood you like to craft?, with the craziness of the holiday we have decided to postpone it till next week. But never fear, it is coming! Hello everyone! I just wanted to pop in and say "hello!" I hope you all had a wonderful 4th! Ours was full of Food, Family, and Fireworks! The perfect combination! Anyway, a few things to note. WYLTC starts today (I think, were running slow) at Under My Umbrella. Melinda created this adorable birdhouse and I can't wait to see what everyone does with it! I have been a busy little bee finishing up my birdhouse, working on my kids bathroom, and taking a photography class. (I'm excited to to actually learn how to use my camera!) Unfortunately, all those things aren't really something I can share with you.... yet. But stay tuned, fun things are brewing! One last thing, I wanted to show off my toes! I had them done this last weekend and think they turned out SO cute! So if you are looking for some cute toe inspiration to file away for next year, here ya go.